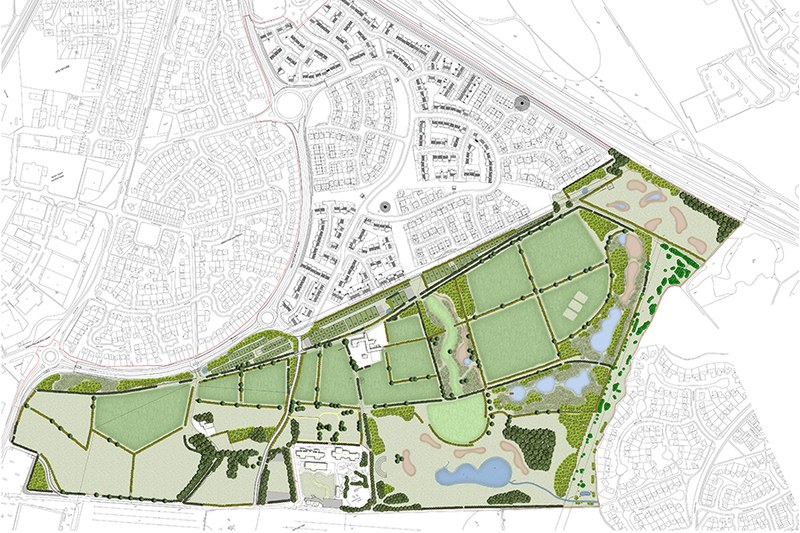 Fairhurst was commissioned by the Northumberland Estates to provide Landscape Architecture services for a proposed mixed use development at Scaffold Hill and extension to Rising Sun Country Park in North Tyneside. Proposals include the development of 450 residential units, community allotments, associated infrastructure and environmental enhancements. Fairhurst’s Landscape Architects undertook the original strategic masterplan for the A19 corridor which identified the site for potential housing. The team undertook a Landscape Assessment to determine likely landscape and visual impacts resulting from the proposed development. This informed the landscape design proposals, including Landscape Masterplans for the residential and Country Park areas, Environmental Mitigation/Habitat Management Plans, and four distinct landscape/streetscape areas. The proposals create enhanced routes and green spaces linking to the Country Park, retaining existing valuable features such as mature hedgerow boundaries, seasonal wetland habitats and ponds to protect designated wildlife corridors within the site. The design creates a high quality landscape resource, with improved features for local and regional recreational, social, and educational use within North Tyneside. Fairhurst were subsequently provided additional services, including preparation of an Open Space Assessment, expert witness advice and Landscape/Ecology Management Plan.